Nearly six months after former Alaska Governor and Vice Presidential candidate Sarah Palin parted ways with Fox News, she is rejoining the channel as a paid political contributor. Palin starts in her new (old?) gig Monday. After she left, Palin tested the TV waters in New York and Hollywood, and found interest from other networks, someone familiar with her decision says. Ultimately, however, Fox News offered the best deal in terms of salary and exposure. 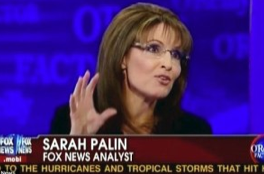 Palin is said to have some flexibility to pursue outside projects, similar to the TLC reality series “Sarah Palin’s Alaska” that aired in 2010. It isn’t clear how Palin’s new deal with Fox compares to her original FNC deal, which was believed to be worth seven figures.